Upgrade mobile App,Design Frame work, Adone Group. Adone Group offers mobile app upgrade service for trunkey projects it has undertaken and for existing mobile applications that the owner wants to add additional features to. In case of applications developed by us for an end-to-end development project, we ensure that we integrate custom design and structure for long term upgrade options, so that the client can make changes at will in a familiar environment. 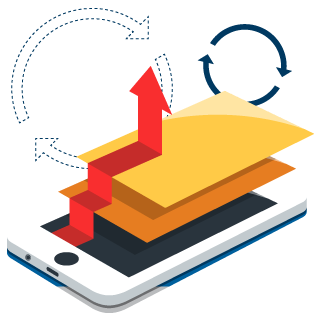 Our mobile app development team is aware of the need to stay updated with the latest technological trends in mobile application development in order to stay on top of the pyramid. They are aware of the latest design frameworks and application trends in the market. We can design custom features, widgeta and extensions for your application.